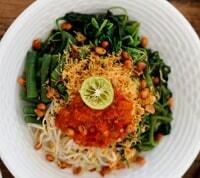 Umm, talking about Balinese foods again, I’m drooling already. However, i hope you’re not, because we still have many things to talk about it. In this month of Indonesian Independence which is in 17 August, now we want to make another list of 17 Things. About what? 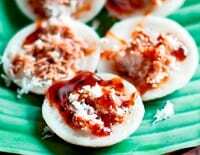 About Balinese Street Foods. You know, we are humans. Human like to eat something in theirs spare time. Especially during holiday, we like to eat anything to fill our tummies. So, its better to fill them with the right foods and the right budget. Street Foods is the answer. Its cheap, and easy to find. 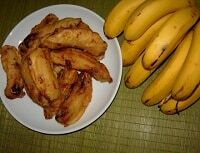 Looking at its appearance, it looks like the thing we called Pisang Goreng in Indonesia. You know, the deep fried banana. So, it maybe a little juicy when you hold it. Anyway, you can find this food almost everywhere in Bali, in every market. You can make it by yourself though, its pretty easy to make. You only need a banana, and then fry it to the cooking oil. Make it crisp by adding some flour. And then, its done. Jaje Godoh made by yourself, the best cook in the world. Hmm, this food is also has the same form like another street food, maybe you still confuse about finding the difference in between. Yep, this food has the same texture like Serabi in Java. It also made by the same ingredients. Maybe the little thing that differ them is the topping. Laklak use more toppings like nut sprinkle, chocolate, and some green stuff added to make the aroma stronger. By the name it has, we can make assumption that this food is none other than Klepon. You know klepon? Too bad if you didn’t. Klepon is like the green balls filled with liquid sugar inside of them. Its very delicious. The name Klepon is not only known by the poeple of Indonesia, but also Malaysian. They love this too. This food is very suitable to filling your empty stomach, or used as dessert. It also easy to made if you want to. Another banana-based food. This one is has the form like Lontong in Java, and has the same filling as the other Javanese street food, Lepet. Its almost the same by the way, Sumping and Lepet. Anyway, the Sumping may have different fruit other than banana to used as a filling. However in Lepet, they always use bananas. So the taste of Jaje Sumping will vary, its a good thing to explore it. Plus the price of it is also very affordable. So you must take a least a piece of 5.000 rupiahs, and buy it for 2 persons. If you eat it once, you want to eat another then eat more and more of it. You better stop. You’ve ever been looking at this delicious food before? I bet you didn’t. 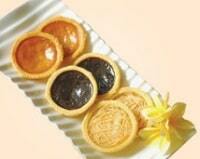 There’s another food in Java that looks the same like this one, but its has more colourful colour. But hey, even though Jongkong is only colored green, you must know the healthy reason beneath it. They only colored green, because they want to maintain the colour of the leaves used in this food. 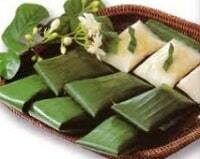 Of course, the Pandan leaves has a green and uniqeu aroma, so they used it. Thats why this food has the natural green colour. This is the people’s favorite. Yep, the one and only Pisang Rai. Even though the ingredients are pretty simple (banana), but the taste is, indescribable. You must try one when you visit Bali. Don;t judge the book by its cover you know. However, by looking at its “covers”, the food looks more delicious. The combination of white coconut and the yellow banana, is something else. You can eat it while having a tea in the evening. Heavenly. May thought that the form is Batun Bedil is made by some eggs. But hey, it doesn’t. They used the flour called Ketan. Then they adding some hot water, and form it to be the egg-like shaped dough. Taste it, you’ll love it. On the other hand, this food can easily be found in many traditional markets in Bali. So if you’re curious, please come by morning or evening. Then you can buy it in the nearest market. And eat it while having a nice sweet warm tea in the evening. Or you can eat it while having a lazy afternoon. Its your decision after all, you can eat it whenever you like. You know, this food has the same shape and form like the famous food in Jakarta, Kolang-kaling. The shape is almost the same, also the colour. But, in Jakarta they served it with some other ingredients to make other kinds of foods. 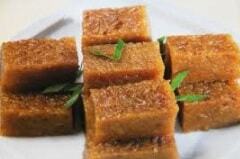 However in Bali, they only need to add some coconut or sugar to eat it. The sweet taste of it will make your day. Anyway, you can eat it with the combination of liquid sugar just like the way to eat kolang-kaling. Or, you can just eat it one by one like snack, but its a little wet. So you can easily swallow it. Hmm. So fresh. Yes, the rujak is well known for the refreshing taste, consist of vegetables and fruits. In Java, they usually added some nut sauce or some chilli to eat it together, along with ice tea. Well, Rujak Kuah Pindang in Bali is a bit different. They add some extracts from Pindang fish. Its so nice actually, the combination of vegetables and fish. You know, the freshly taste of the fruits and the yummy feels of the fish is like a perfect combination. Its such a good thing though that Balinese people found this. Umm, i don’t know if this food is categorized into crackers or breads, because even though it looks like cracker, its a bread! The bread is shaped oval, just like other bread, but smaller. May you can eat them whole in one go. This is perfect for your resting time or as a reading friend. Some people like to eat while reading, right? So maybe this is the perfect food, healthy and delicious. Ah, the famous food in Bali. This thing is like a tourist favorite in Bali. Many bought it to brought them home for their relatives. Its a pie, but with milk. The combination of Milk inside of Pie is indeed wonderful. So that’s why, many gift shop in Bali sell these things to the tourists. Rujak Bulung is the same like Pecel in Central Java. The vegetables, and the sauce are almost the same. You should try it though, its a good thing for breakfast. Its like Indonesian Salad you know. Just difference in sauce. So, it must be a good food too for vegetarians out there. Want to taste it? This is not like ordinary porridge that made of usual white rice or some kind of that. This special thing is made from Ketan rice. The black one to be exact. Meanwhile, like other thing made of ketan, the texture of this porridge is a little bit sticky, yet easy to swallow. So, this food is good either for normal or sick person. Serombotan is almost the same like Rujak Bulung. The difference is there’s no coconut toping on top of Serombotan. This food is just pure coconut sauce and vegetables only. Its a healthy food to eat in the morning. And also refreshing one in the day. Its perfect. Hey, even though the shape isn’t something, but the taste is really something. You know, don’t judge the book by its cover (I know i said this too many times, but its a fact!). The creamy and sweet taste is welcoming you once your tongue touches its core. There’s no core actually. Its just a chocolate shape box that very simple to eat. You can eat it whole f you want, and if you can. And for your information, the price of it is pretty affordable, so you might want another one or two. Bendu is almost has the same shape as the Lepet or Lontong and Java. But remember, only the shape, only its cover. However inside, its totally different. Once you open its leaf cover, you can see the white coconut bar lying there. Once you eat it, the sugar will melt out of it. So you can imagine what its like, the sweet combination of coconut and the sweet caramel. 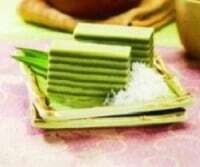 This food is a little bit hard to find actually, and can be found only in some villages in Bali. Why? 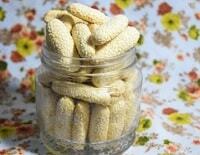 Because this food is considered an ancient ones, and only develop in certain areas in Bali. If you want, you can make one. Its only based on Ketan rice (again) and the addition of coconut on top of it. Its actually the simple one. However, its tasty. That’s about it guys, the full 17 street food in Bali only for you. I’m already full, just by reading it. However if you haven’t, you should try to come to Bali and try them by yourself sometimes. Explore it till your tummy explode!